Let’s start this post off by setting some context. What I’m about to spout concerns the development of large, complex, software systems – not mobile apps or personal web sites. So, let’s rock! 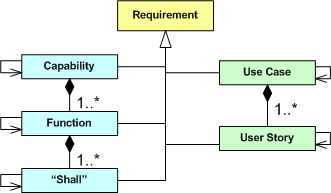 The UML class diagram below depicts a taxonomy of methods for representing and communicating system requirements. 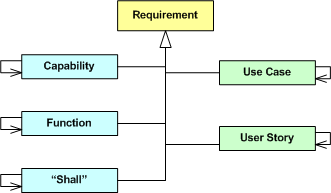 On the left side of the diagram, we have the traditional methods: expressing requirements as system capabilities/functions/”shalls”. On the right side of the diagram, we have the relatively newer artifacts: use cases and user stories. When recording requirements for a system you’re going to attempt to build, you can choose a combination of methods as you (or your process police) see fit. In the agile world, the preferred method (as evidenced by 100% of the literature) is to exclusively employ fine-grained user stories – classifying all the other, more abstract, overarching, methods as YAGNI or BRUF. 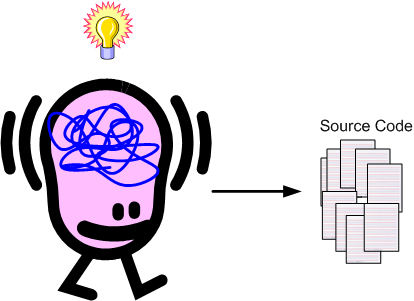 As the following enhanced diagram shows, whichever method you choose to predominantly start recording and communicating requirements to yourself and others, at least some of the artifacts will be inter-coupled. For example, if you choose to start specifying your system as a set of logically cohesive capabilities, then those capabilities will be coupled to some extent – regardless of whether you consciously try to discover and expose those dependencies or not. After all, an operational system is a collection of interacting parts – not a bag of independent parts. Note that, taken literally, the last bullet implies that you don’t start writing ANY code until you’ve completed the full, two step, capabilities-to-“shalls” decomposition. Well, that’s a croc o’ crap. You can, and should, start writing code as soon as you understand a capability and/or function well enough so that you can confidently cut at least some skeletal code. Any process that prohibits writing a single line of code until all the i’s are dotted and all the t’s are crossed and five “approval” signatures are secured is, as everyone (not just the agile community) knows, both inane and insane. Of course, simple projects don’t need no stinkin’ multi-step progression toward source code. They can bypass the Capability, Function, and Use Case levels of abstraction entirely and employ only fine grained “shalls” or User Stories as the method of specification. 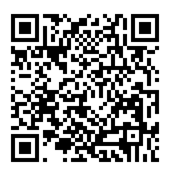 The purpose of this post is to assert that there is no one and only “right” path in moving from requirements to code. The “heaviness” of the path you decide to take should match the size, criticality, and complexity of the system you’ll be building. The more the mismatch, the more the waste of time and effort. In order to allocate requirements to a design, you must have a design in mind that you think satisfies those requirements. Circularly speaking, in order to create a design (like the one above), you must have a set of requirements in mind to fuel your design process. Thus, RAID == DIRA (Design Is Requirements Allocation). The figure below shows the movement from the abstract to the concrete through a nested “allocation” process designed for big and complex products (thus, hackers and duct-tapers need not apply). 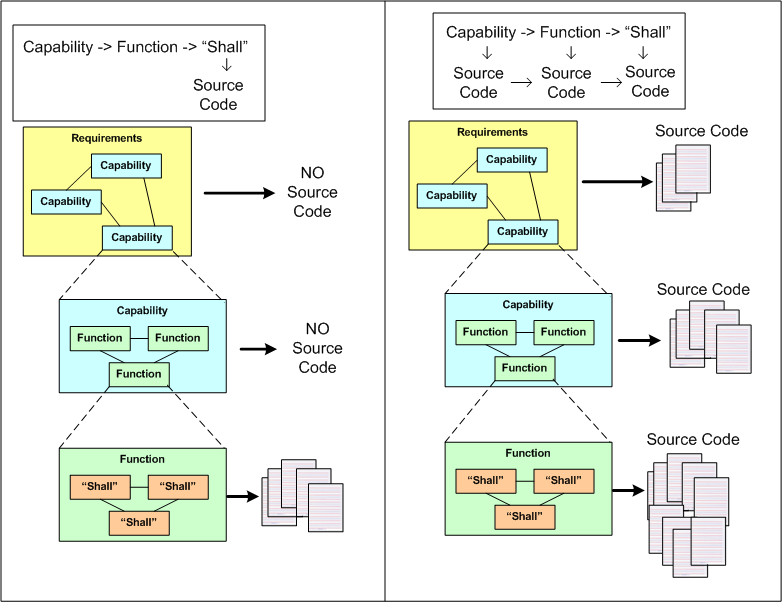 “Shalls” are allocated to features, which are allocated to functions, which are allocated to subsystems, which are allocated to hardware and software modules. Since allocation is labor intensive, which takes time, which takes money, are all four levels of allocation required? Can’t we just skip all the of the intermediate levels, allocate “shalls” to HW/SW modules, and start iteratively building the system pronto? Hmmm. The answer is subjective and, in addition to product size/complexity, it depends on many corpo-specific socio-technical factors. There is no pat answer. Which process variation, if any, is “best”? Again, the number of unquantifiable socio-technical factors involved can make the decision daunting. The sad part is, in order to avoid thinking and making a conscious decision, most corpo orgs ram the full 6 level process down their people’s throats no matter what. To pour salt on the wound, management, which is always on the outside and looking-in toward the development teams, piles on all kinds of non-value-added byzantine approval procedures while simultaneously pounding the team(s) with schedule pressure to compplete. 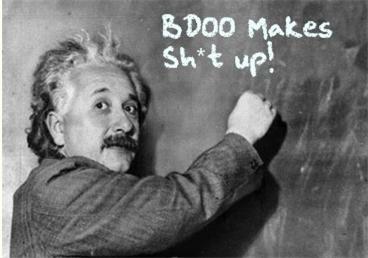 If you’re on the inside and directly creating or indirectly contributing to value creation, it’s not pretty. Bummer.